Rated 5 out of 5 by hmmockabee from high quality, simple use High quality materials, simple to use. Always gets the job done. Rated 5 out of 5 by HIGHLANDER1979 from Works great! I inherited a Ridgid 10" pipe wrench manufactured around 1953-56 from my father. It works just as well as the newer versions I have in supply. Rated 5 out of 5 by hawkaggie from Excellent Pipe Wrench I've used RIDGID pipe wrenches for more 30 years. I haven't found a better pipe wrench anywhere! Rated 5 out of 5 by regunter from good bite, ease of opening and closing These wrenches are a must have in the arsenal of hand piping tools. Easy to use and clean for repeated work. Rated 5 out of 5 by garzbrizoil from great outdoor use and resistance to weather We own an oil field lease crew service company. All our trucks must be equipt with the best tools. They MUST resist weat and tear and the ever changing weather. I can gladly say that Rigid tools is the best tool brand. Rated 4 out of 5 by WomanOfHouse from recommend Great product and highly recommended. Easy to use. Rated 4 out of 5 by kjschmidt from The grips on the teeth keep it where you need it. 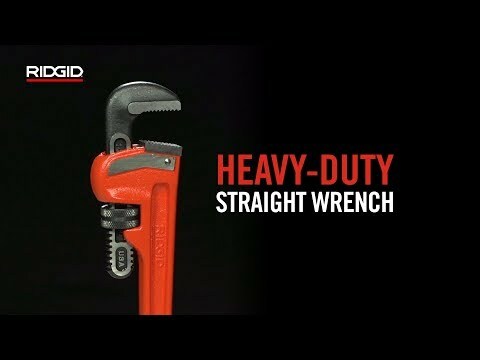 The Ridgid 31025 is the best pipe wrench I have owned. The grips on the teeth ensure that the wrench stays where you want it. The only downfall is that the swivel nut to expand/decrease the mouth opening can become hung causing slight aggravation. Rated 5 out of 5 by Penlover from This product is awesome. I love this product. It performs like it's suppose to. Rated 5 out of 5 by vitra001 from Great durability and design. Having a tool that I can count on over the years has always made turn to one tool brand. The pipe wrenches durability only leads me back to buy more great tools. By far no other brand tools come close to Rigid!! Rated 5 out of 5 by vikame from classic the only tools my dad ever used. he gave each one of us one as a shower gift when we got married. we've all used them numerous times. Rated 5 out of 5 by mbplumbing from Great quality wrench The Rigid Pipe wrenches are durable and make my job easier! What else can you say about a great quality wrench! Rated 5 out of 5 by MRGJB from This product greatest made Using Rigid for over fifty years. Still use them daily knowing there the best made. When i need another rigid no question. Always the only smart choice. Rated 5 out of 5 by dryshavy from Simply the best pipe wrench out there. We have approxmiate 20 of these wrenches in house and use them everyday. They last, take a beating, and never stop working. They are simply the best pipe wrench out there. Rated 5 out of 5 by herschel69 from Durable and long lasting. I have multi[ple sizes of these wrenches dating back to the '80's. Jaws still sharp. Good as when new! Just add a little oil occasionally, keep clean and dry! Rated 5 out of 5 by jeffmoss26 from never let me down I've been using Ridgid tools all my life. As the nephew of a plumber, I learned early of the importance of quality tools. Ridgid tools never let me down and I always pick up old pipe wrenches when I see them at garage sales. Rated 5 out of 5 by LCason from There's only one Ridgid Having used pipe wrenches for many years there is a difference. There are many copies but there is only one Ridgid brand pipe wrench. they give many years of service. The wrenches are serviceable too. Rated 4 out of 5 by pnags05 from great dependability Works great just like it should. On the heavy side but you'll never tear it up. I've bent the aluminum ones with a cheater bar.